I recently attended an “Author’s Night” at the home of a friend. The author was Ericka Johnson, an American living and working in Linköping as a researcher at the university in that city. Her book is Dreaming of a Mail-order Husband: Russian-American Internet Romance. Naturally, I bought a signed copy and have now finished the reading of it. The provocative title of this blog is from page 92, where Ericka quotes a psychologist at a regional women’s shelter. This is a “favorite Russian adage” that needs, according to the psychologist, to be shown not to be true in order that the problem of domestic violence in Russian society can begin to be addressed. But the thrust of the book is not about domestic violence or “feminist” issues, although the latter subject is skillfully presented from both the USA and the Eastern European perspective. A “feminist” in Russia is quite a different person from someone in the USA or Western Europe with the same appellation. The author presents a general framework based in highly skilled and informative research on the interplay of modern Internet-based communications and social trends affecting personal relationships. Within this framework we are presented with the stories of six women from countries in the former Soviet Union, also skillfully told, but from a personal and quite soulful perspective. It is a credit to the author, in my opinion, that she can switch hats from being researcher to being sympathetic observer, and back, without harming the integrity of either position. One can see that there is an imbalance in the female/male ratios of the three former Soviet Republics of Belarus, Russia and Ukraine in the age group 15-64. Moreover, the life expectancy for males is substantially below that of females in these countries, absolutely and as compared with the USA. These few underlying demographics are, I believe, at the root of many of the findings presented and cited by the author. She also shows the effects of the socially acceptable high consumption of alcohol (primarily vodka) as a force in destabilizing fruitful and ‘normal’ family relationships between men and women. There is so much more to this book that I dare not risk misrepresenting it to you. I urge you, therefore, to buy the book and become enlightened, as well as soulfully entertained by the stories of the six women and, in some cases, their American men. 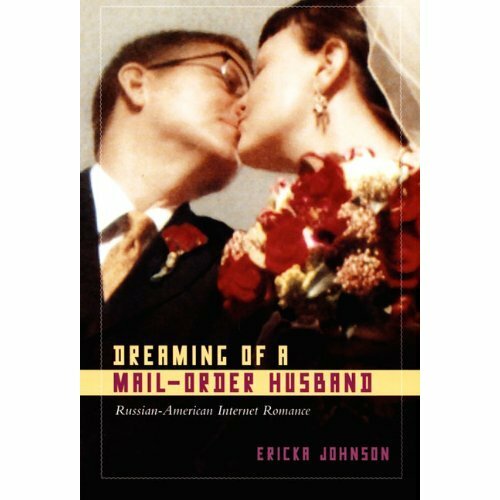 This entry was posted in Belarus, Demography, Russia, Ukraine and tagged Dreaming of a Mail-order Husband: Russian-American Internet Romance, Ericka Johnson, Mail Order Marriage, mail-order brides, mail-order husbands. Bookmark the permalink. Congratulations for this and the previous articles of yours. I wish you nice and fruitful time on Jung at Uppsalla.